Friday morning I woke up to find I had no coffee. I sleepily texted my neighbor for a cup and then spied out my front door only to see her leaving before getting my text. I made some tea and sat on my couch staring blurry-eyed at my computer. Eventually I heard a knock at my backdoor, in my groggy state I guess it startled me and I walked, or maybe I should say stumbled to my door, or maybe I should say into my chair. I stubbed my toe but tried to play it off and show gratitude to my neighbor bearing the promise of wakefulness. Later I found my little toe was crying out in pain. You know stubbed toes usually hurt wicked for a minute and then subside? This was oposite, not too bad at first but quickly going into pain that triggers my sailors mouth. After hopping back to my couch I looked down to find it looked a lot like the photo of M's eye I recently posted (you are welcome for me not posting photos of my mangled foot). Yep, it was definitely broken. None too happy was I. But ever the optimist and hypochondriac I decided to look on the bright side: i didn't have to imagine anything being wrong with me, less thanksgiving cooking for me, a great excuse to allow for a messy house and a reason to lounge around drink wine (a little extra for the pain of course) and watch good movies all weekend while getting some pillow orders done. 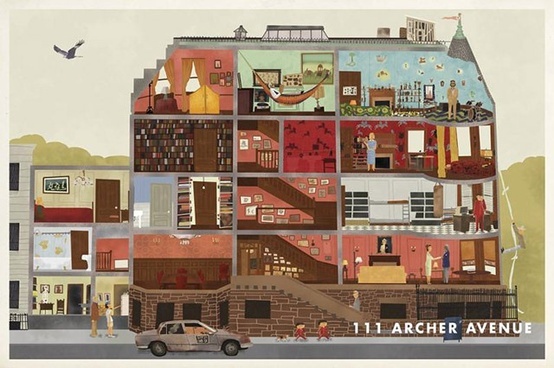 The best part was the glorious role reversal of me being the one saying "ooo, ooo, can you get me..."
I ended up watching a surfeit of movies, I started with Moonrise Kingdom with my oldest, Fisher, he is a real movie buff and I hadn't realized he hadn't seen any Wes Anderson movies (what?!) - he loved this one, so we kept going with an anderson movie marathon. I also watched a documentary called First Position (which is about children ballerinas whose feet look a lot like mine. I felt a kinship with these little feet.). He wasn't as into that one as I was. This list goes on but I will stop there. How was your weekend? See any good movies? I am taking recommendations as I have a few more days on my couch and don't want to slide into any reality tv marathons. . .
Labels: art , everyday life , Misc. i love all your movie posts, they are some of my favorites of yours! Thanks Ada xo! I have always wanted to be a Tenenbaum too. So much so that I was Margot last year for Halloween - fur coat, blonde wig, and a cinnamon stick wrapped around my finger as her wooden one. I hope your son likes that one when he sees it! And so sorry to hear about your toe! Definitely have that glass of wine (or two!) and take it easy! Um, that's really awesome! Pictures? 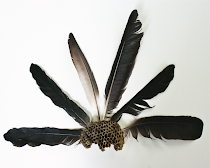 Next year maybe I will make (or suggest?) that Fisher can be Chas and the babes, M+L, can be the two boys Ari and Uzi for Halloween! I love the Tennenbaums A LOT, but I wanna be Jack in the Darjeeling Limited! I love that one too! I would probably be any of their characters they are all so fantastic! Sorry to hear about you toe! There are so many films I could recommend - the list is endless. This weekend I borrowed two DVDs at the library: 'Tinker Tailor Soldier Spy' with Gary Oldman, a film I have heard so much about, and 'Albert Schweitzer' (http://www.imdb.com/title/tt1249311/). I haven't watched them yet. We watched Midnight in Paris this weekend while my son was at a sleepover. I think he'd like it, but maybe when he's a bit older and can really enjoy all the art and literary references. I've broken my toe in similar fashion (we have painted concrete steps leading up into our house, and - in flip flops, of course - I simply didn't raise my foot high enough as I was running into the house one day). Of course we were leaving for a trip to Hungary the next day. Harder to rest. Of course, we are big fans of the Oceans series around here. Feel better! Your weekend sounds good except for the stubbed foot! Your poot thing. I've broken so many toes that way, thankfully you were luckier! I'm with Lauren, Midnight in Paris is my go-to and so are the Oceans series movies. And Amelie. Haha, so basically anything with European undertones. Oh man! I hope you feel better soon - yikes. My sister and I will be watching Moonrise Kingdom this week but we first caught up with the oldies like The Birds. I also spent most of my weekend on the coach, wondering why the winter is almost here and feeling a bit blue, watched Ps I love you, Ted, and The rocky horror picture show, so bad, well I loved PS I love you again. i still haven't seen Ted . . . did you like it? Oh no! I'm so sorry you broke your toe! That's crazy. I saw Moonrise kingdom recently and loved it. 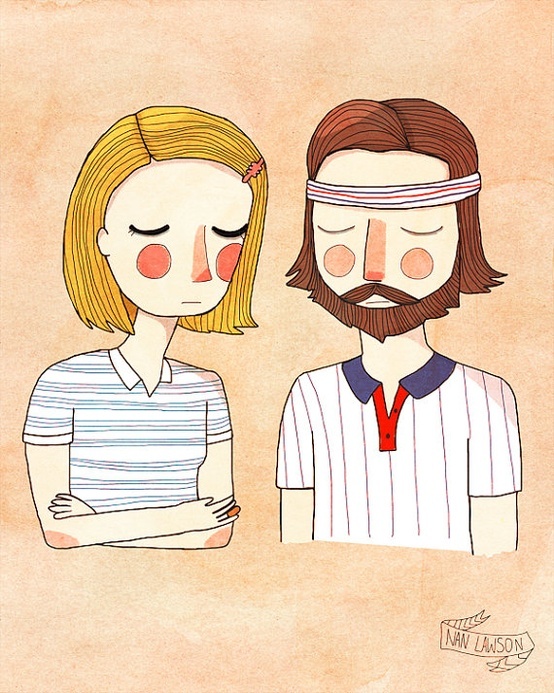 And I have always wanted to be a Tenenbaum. I love Wes Anderson but I haven't seen The Life Aquatic yet. It's next on my list. i loved the life aquatic and love the soundtrack for it too! It's funny you mentioned Moonrise Kingdom, my boyfriend and I were just about to watch that movie before I suggested we do a question and answer game. I actually just blogged about it today! 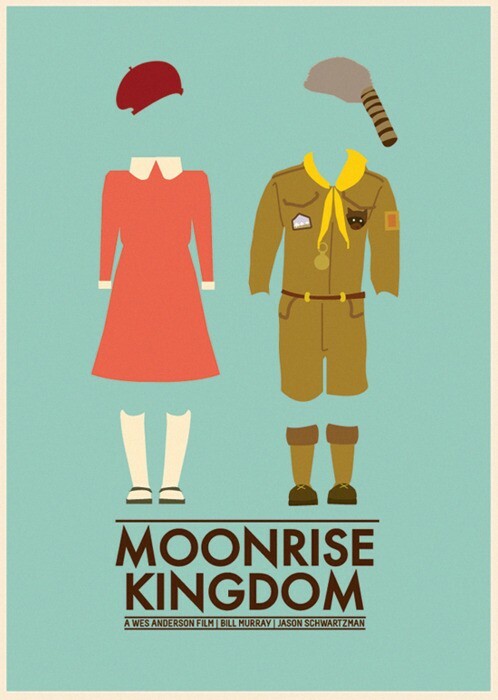 Next time, Moonrise Kingdom shall be watched! Excited about it! it's really good! just the color palettes in his movies make me happy enough. Yo amo esos póster y lo que dicen... Very good post!!!! oooh, that would be bad. thank you. love harold and maude and i have only seen love actually once when it first came out. i think it's time to watch it again, it's a bit christmasy too, isn't it? 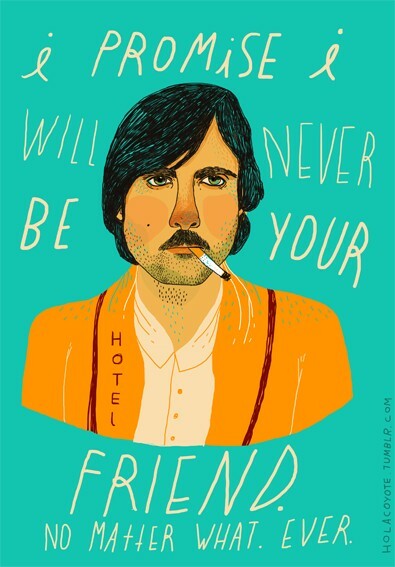 See, I knew there was a reason I liked you - You're funny, and you like Wes Anderson movies. ;) Moonrise Kingdom was the sweetest film. I really enjoyed it. True story: My husband thought I was taking him to see the new Batman movie when I told him we were seeing Moonrise Kingdom. Needless to say, when I looked over at him 15 minutes into the movie, he looked very confused. Ha! 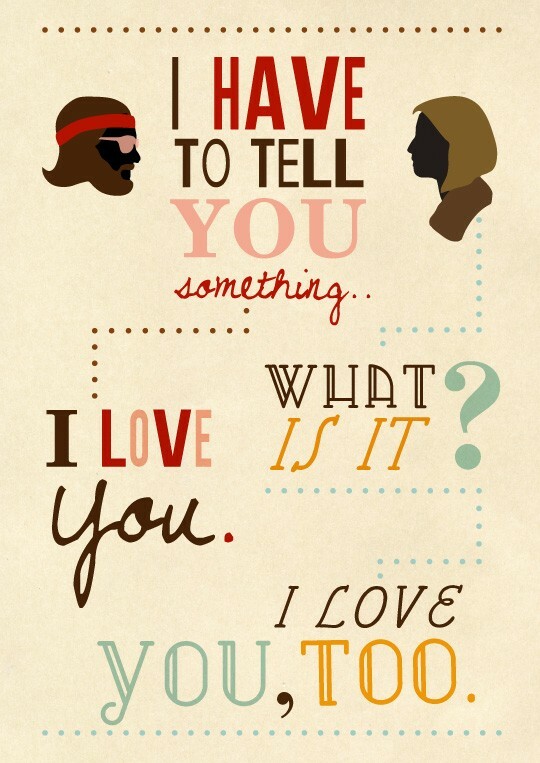 Moonrise Kingdom was probably the last "good" movie I saw. Breaking Dawn doesn't count, right? I was coerced. PS~Sorry to hear about your toe! Oh no! Poor toe. Poor foot! I do hope you'll be better soon. I actually have Moonrise Kingdom on my Netflix list as my next movie. Looking forward to seeing it. I saw Twilight over the weekend. Don't ask. And certainly don't leave your home with a broken foot (or maybe otherwise) to see it!